Lunch Hour NYC, the exhibition I wrote about last November on this very blog, is now up and free and open to the public. My co-curator, Laura Shapiro, and I are incredibly thankful to everyone who made Lunch happen, especially the exhibitions staff at the library and the incredibly talented designers at Pure+Applied. They were tireless in making sure everything looked perfect, but full of humor all the while. It's been a hectic several weeks, but we're really pleased with the results and the response. Now I'm back to my regularly scheduled duties which include culinary acquisitions, electronic resources, What's on the Menu? (a million dishes strong! ), and coming soon: culinary research classes. But first I wanted to share what is perhaps my favorite image from the show. It also happens to be of one of my favorite foods: doughnuts. I generally don't veer toward chocolate-covered anything, but I will make an exception for this photograph. It's especially meaningful to me because when Laura and I were going through the Horn & Hardart papers in the library's manuscript division, we found fantastic images of automats throughout the city: street views, interiors, workers, but we never found a single food image. Then, in the very last box, in the very last folder, we uncovered photographs of soups, sandwiches, cakes, ham, and doughnuts. Despite our naturally reserved nature (not to mention the fact that we were in a quiet reading room), we -- how shall I put this? -- freaked out. I might've gasped or jumped. Laura definitely put her hands in the air in some sort of celebratory gesture, and we then proceeded to show the photograph above to every single person in the room, without exception. They didn't necessarily share our enthusiasm. 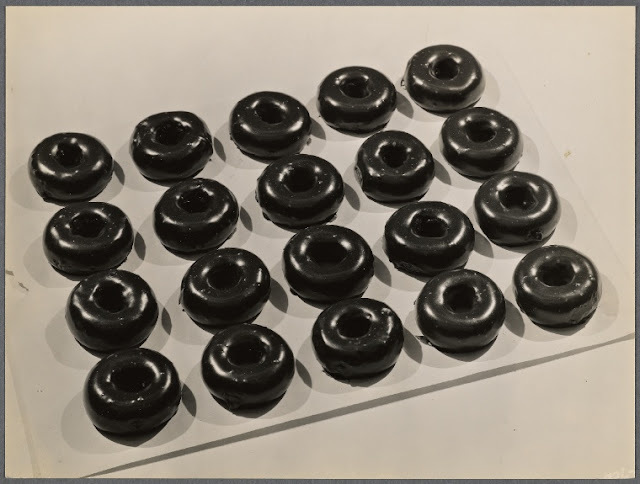 So there you have the thrilling story behind a black and white photograph of doughnuts. You, Laura, and the entire team deserve a huge congratulations for staging the exhibit. My wife, son and me managed to see it on opening day, and we could not have been more thrilled. I have gone through the library's H&H collection and recall how overwhelming it seemed. I think you really found the gems. I am looking forward to seeing the exhibition again with the rest of our family. Thank you, Mr. Mazzone, for your kind words! 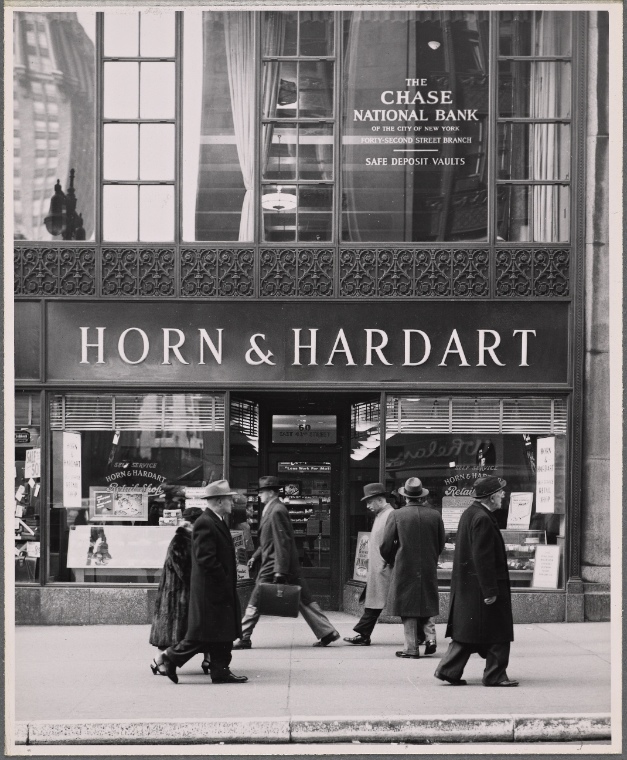 Will the Library make reproductions of this image available for purchase? Very Large? Rebecca Federman is a librarian at the New York Public Library. She works with both subscription databases and food collections, including the Library's menu collection. She was also the co-curator of Lunch Hour NYC. Her favorite food is, and always has been, spaghetti. © 2011 Rebecca Federman. All rights reserved. Simple theme. Powered by Blogger.